The French Directorate General of Armaments (DGA) has received the third of four fast amphibious landing craft Engin de Débarquement Amphibie Rapide (EDA-Rs) n°3 at Toulon, France. The French Navy’s Mistral-class Bâtiments de Projection et de Commandement (BPC) amphibious warfare ships will operate the EDA-R. 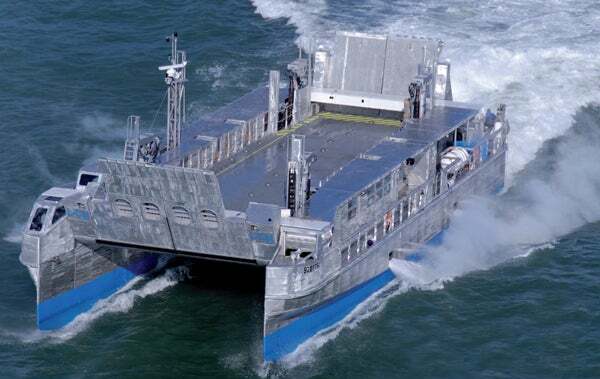 The 30m-long and 12m-wide catamaran landing craft vessel can carry a payload of 80t and will provide five times the landing capacity of the French Navy’s current landing craft. The EDA-R, when fully loaded, can cruise at a speed of 18knots and will be used for landing military vehicles and troops from ships positioned beyond the horizon (55km) and for humanitarian missions. EDA-R is a fast catamaran in transit mode and features central elevating deck that enables it to turns into a flat-bottomed ship to beach or enter an amphibious ship’s well deck and is based on a Landing Catamaran (L-CAT) concept. Two EDA-Rs can be accommodated on each new Mistral-class building BPC amphibious ships in its well deck. DGA accepted the first EDA-R (L9091) in November 2011 while the second EDA craft (EDA-R 2) in January 2012, which is currently in service with BPC Dixmude for the Navy. The fourth EDA-R is scheduled for delivery in second half of 2012. The 199m-long BPC destroyers have a displacement capacity of 21,500t, can cruise at a speed of 19 knots and can accommodate 450 troops and 16 heavy helicopters, including options for one or more landing craft and armoured vehicles. The Mistral-class ships will replace the navy’s Foudre landing craft transport vessel and will be used as a training ship for the French Navy’s Jeanne d’Arc mission in 2012. The Mistral and Tonnerre replaced the L9021 Ouragan and L9022 Orage, which were built at Brest Naval Dockyard and entered service in 1965 and 1968 respectively. Image: EDA-R is based on a unique concept known as Landing Catamaran (L-CAT). Photo: CNIM.